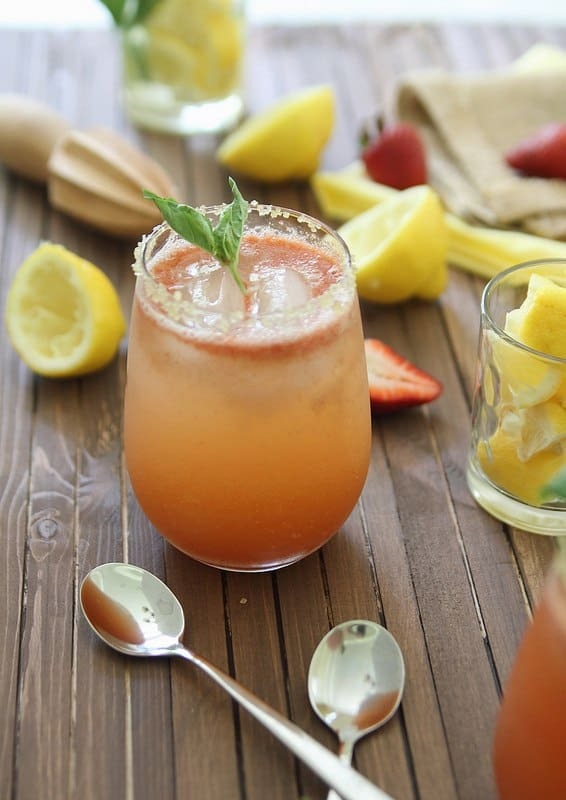 This strawberry basil lemonade is a refreshing summer drink. really sunny & hot out (good for tan line eradication). I basically spent 3 hours on the beach in full sun during the middle of the day drinking only one 16oz. bottle of water because I was paranoid I’d end up having to pee and have nowhere to do so (the water wasn’t an option since I’m pretty sure I’d have emerged with hypothermia given it’s temperature). We decided to go for a walk around 3pm, right at the end of the day and the combination of the direct sun, about 50oz. less water intake than I normally drink by that time and the effort of walking through non-compact sand for almost 2 miles had me literally fantasizing about drinks. Which got me thinking. You know the saying “dying of thirst”? Yeah, well that’s gotta be one of the most miserable ways to go. No? Gun shot? Quick & barely enough time to realize what happens before you’re gone. Drowning? A bit worse than a gun shot for sure, but still…a minute or two and it’s over. Thirst? Holy eff. The thought of having to endure the feeling of longing for something liquid for days on end after just experiencing an hour or so of it, seems like the worst kind of torture I can imagine. Ok, if you watch Game of Thrones, maybe Theon has it a bit worse. But just barely. In retrospect, I think I’d have rather peed in my bathing suit from drinking too much than deal with the thirst from not drinking enough. Basically, I wouldn’t wish that feeling on my most hated enemy. So make some lemonade, add some strawberries and basil and do the hydration right. Just keep a bathroom close by. 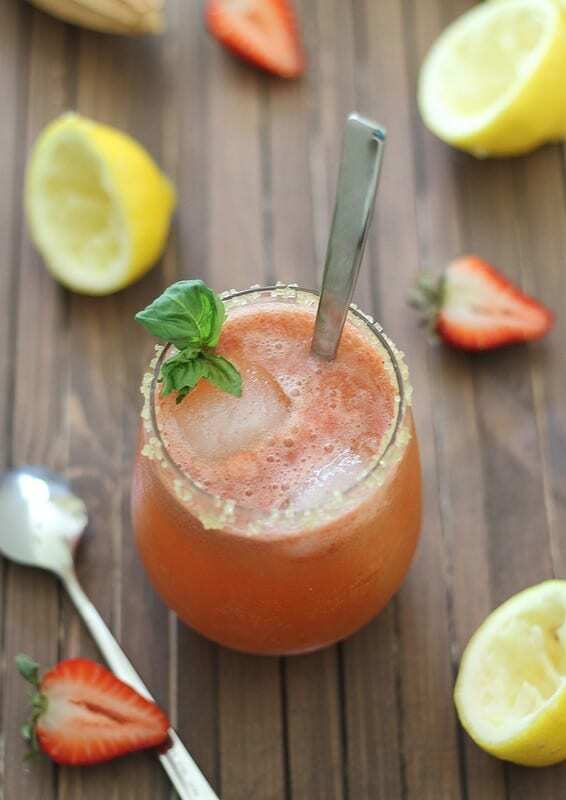 A refreshing summer lemonade with strawberries and basil. Combine the strawberries, basil, lemon juice & pulp and honey in a blender and blend for about 30 seconds until a smooth puree forms. Pour about 1/4 cup of the puree into a glass with ice and top the glass off with 8oz. of water or seltzer. Stir and serve. This looks so refreshing and delicious :) Thanks for sharing. That is one of my biggest beach fears NO BATHROOM! I can’t handle that kind of situation. I want some of this amazing lemonade stat! This would be such a perfect summer drink!! Oh man NO bathroom freaks me out anywhere. I need to know where a bathroom is at allllllllllllllll times! Ha, the only redeeming thing about Jersey! That’s amazing. The drink sounds amazing!! I need more fresh juice in my life and this is definitely going to be on my list to try. I just started reading and watching GoT, simultaneously – and oh holy crap – I have been missing out! Also, if I don’t have a water bottle within like five feet of me, I start freaking out. That would be. The. WORST way to go. Just hand me five of these though and we’re good. Oh my gosh no public bathroom! That is absolutely miserable. This drink looks great. One of my biggest fears is not having a public bathroom. So i totally get that. And this lemonade. I could get on board with it. I could definitely stay more than hydrated with this lemonade! Sorry about the sans public restrooms! I had a lemonade-basil-spritzer at a party this spring and it was amazing! The strawberries would make it that much better. I ALWAYS crave a refreshing lemonade in the summer! Always. Whenever we’re on walks or at the beach, I always get the craving for it. I would guzzle this down! There are few things worse than being that thirsty! I feel like that’s how all of my long runs have been ending lately. This lemonade looks so refreshing and absolutely perfect for summer! 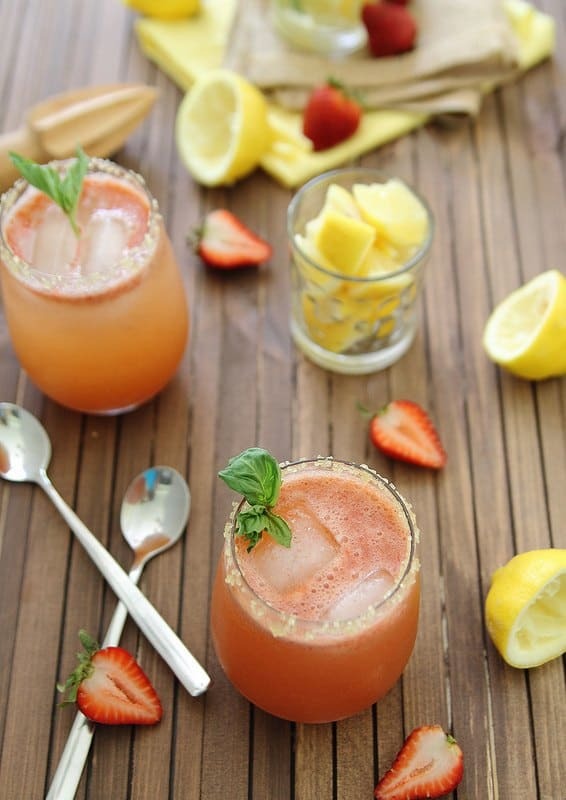 I love strawberry lemonade, and this looks delicious! Ok, this post had me cracking up! This is exactly something I would do. Limit myself to avoid public restrooms! This sounds perfect for a hot summer day! Pinned and Stumbled! It’s 1/3 total. So just juice the lemon until you get 1/3 cup, pulp + juice combined.